This is by no means an overstatement. 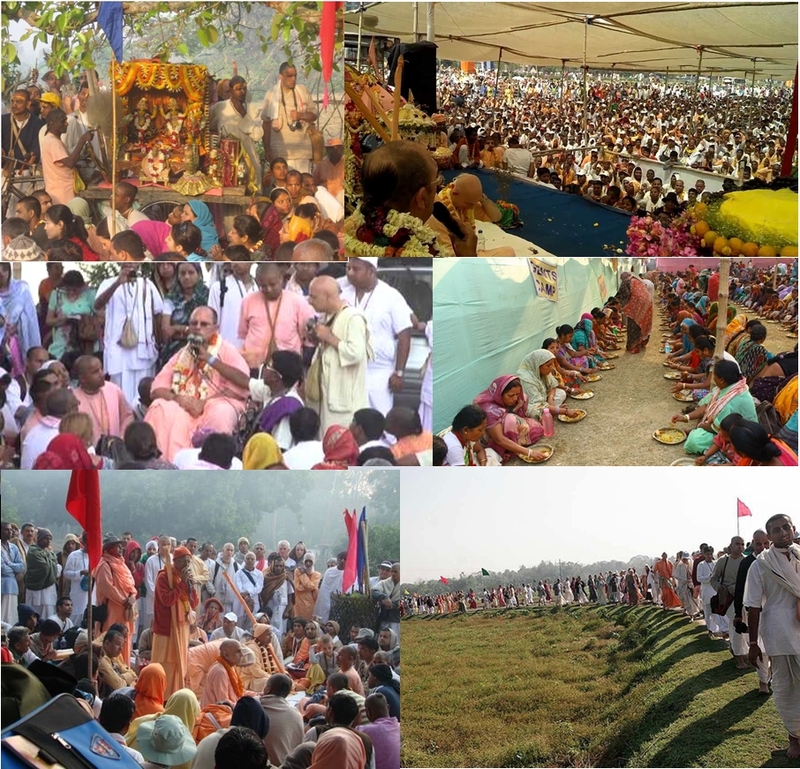 The effect of chanting the holy names of Lord Krishna on the sacred land of Navadvipa has tremendous effect on the energy pervading the world. This sound vibrations are purely spiritual and produce spiritual energy, which is superior to material energy. When the atmosphere is surcharged with spiritual energy its effect goes beyond mundane calculation. Srila Bhaktivinoda Thakura wondered, “when will that day come when the fair-skinned foreigners will come to Sri Mayapur dham and join with the Bengali Vaishnavas to chant, Jay Sachinandana, Jay Sachinandana. When will that day be?” He wondered did not really mean he did not know that it was coming soon. 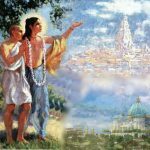 A person who could visualize the astoundingly beautiful Temple, the adbhuta mandir, predicted by Lord Nityananda, more than a hundred years before its actual construction began cannot be not knowing when the people from all over the world would come together and chant the holy names of Lord Chaitanya Mahaprabhu in Sri Mayapur. 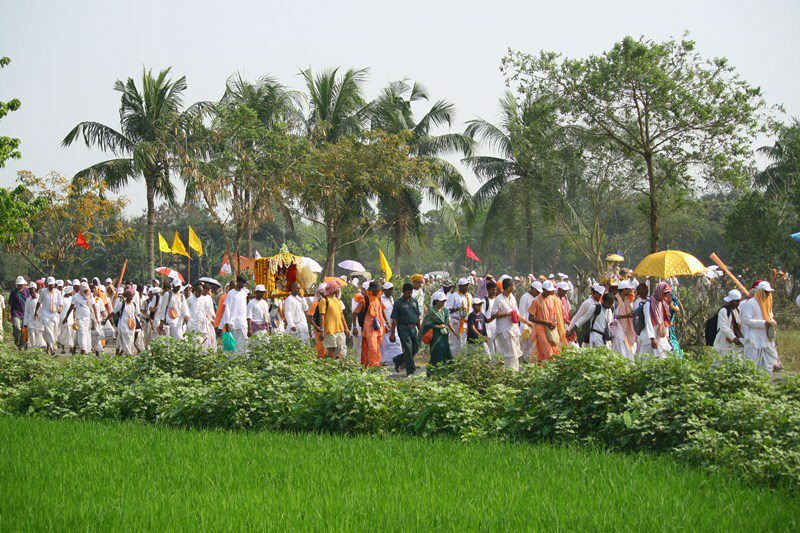 Sri Navadvipa mandala parikrama shows how the words and wishes of Vaishnava acharyas always come true. It was none other than Srila Bhaktivinod Thakur who said that just by the performance of Navadvipa mandala parikrama the world can be liberated. This is by no means an overstatement. The effect of chanting the holy names of Lord Krishna on the sacred land of Navadvipa has tremendous effect on the energy pervading the world. This sound vibrations are purely spiritual and produce spiritual energy, which is superior to material energy. When the atmosphere is surcharged with spiritual energy its effect goes beyond mundane calculation. 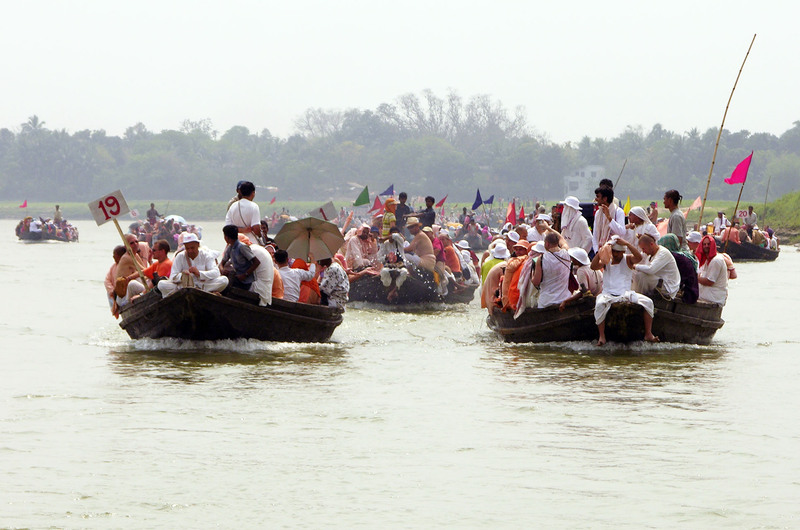 Every year ISKCON, the International Society for Krishna Consciousness, and a few other prominent Gaudiya vaishnava temples organize Sri Navadvipa mandala parikrama during the Gaura purnima festival. 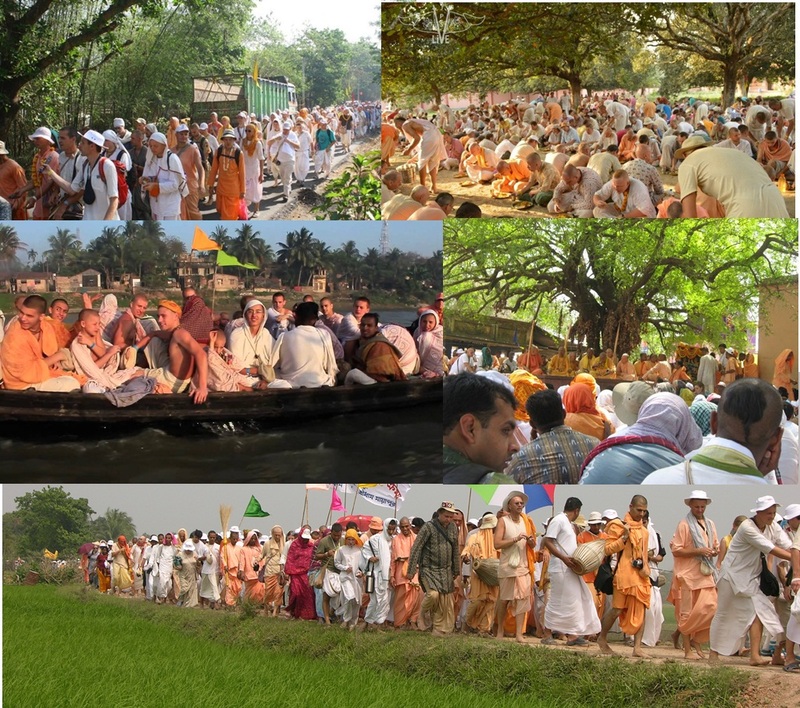 Devotees from all six continents, old and young alike, come together and walk around on this holy and beautiful land in groups camping overnight on different islands. 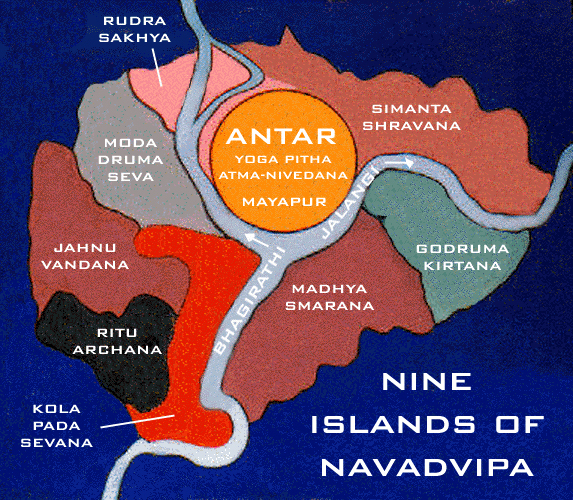 Last year we published an article describing the process and benefits of performing Sri Navadvipa mandala parikrama. The difference between hearing and reading about mundane subject matters and spiritual matters, especially the pastimes of the Supreme Lord, is that one gets bored after repeatedly hearing mundane subject matters but one becomes increasingly eager to repeatedly hear transcendental subject matters due to their spiritual nature. 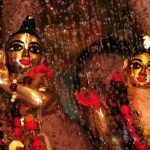 The following content is reproduced from Knowing more about Sri Navadvipa Mandal Parikrama published on Mayapur Voice last year. It started with Lord Nityananda Himself taking His dear devotee, Jiva Gosvami, on a tour to this mystical and most merciful land of Sri Chaitanya Mahaprabhu. 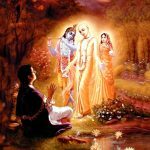 He said to Jiva: “My Gauranga never gives up Mayapur or Navadvipa. 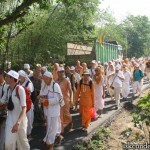 The devotees can perceive His daily Lila. 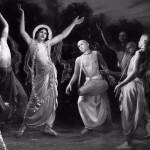 You, Jiva, will also see Gauranga dancing.” When Jiva Gosvami heard this, with tears in his eyes, he fell flat like a stick at Nityananda’s feet and requested, “You will show real mercy on this unworthy wretch if You Yourself take me on parikrama.” Hearing this, Nityananda Raya simply said, “So be it”. Lord Nityananda then took Jiva Gosvami around Sri Navadvipa Dham. In 18th century, Srila Bhaktivinoda Thakur, after having received an order by Lord Chaitanya in a dream, did an extensive research using old maps, manuscripts, government records and scriptures in order to relocate holy places where Lord Chaitanya enacted wonderful pastimes. In 1887 the original birth place of Lord Chaitanya in Sri Mayapur, known as Yoga pith, was discovered. Srila Bhaktivinod Thakur instructed his son and spiritual successor, Srila Bhaktisiddhanta Sarasvati Thakura, to develop Sri Navadvipa Dhama parikrama, for by its performance, he said, all people of the world can be liberated. Previous articleLord Shiva – Myth or Master?